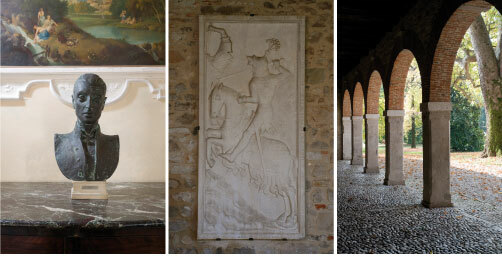 The Casagrande of the Conti Brandolini d'Adda was first built in the 15th century. The family portraits, paintings and antiques tell the story of the family's fortunes. Their history in Italy can been traced to the 5th century AD. Eventually they served to protect the Serenissima's (The Venetian Republic) northern borders. The family's military eploits go back to the 8th century until the end of the two World Wars. 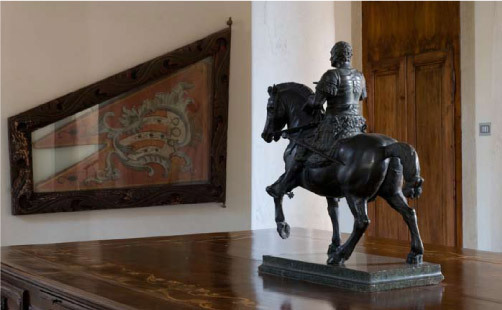 The Brandolini d’Adda family has a family crest that dates back to the thirteenth century. The battle standard features a scorpion that the family is allowed to carry after they conquered a banner from an Ottoman squadron decorated with scorpions. You will encounter this scorpion in many works of art present in the house. Brandolino Brandolini was the brother in arms of the "condottiere" Erasmo da Narni (1370-1443) one of the most famous renaissance leaders of Venice's armed forces. Erasmo da Narni, also known as the "Gattamelata" (The Honeyed Cat), was immortalized by amongst others Donatello, who created one of the Renaissance's most famous equestrian statues which, today, still stands in front of Padova's cathedral. The Venetian Republic gave the feud of Cison to the Gattamelata and Brandolino Brandolini as a reward for their heroic services. Brandolino later married Erasmo's daughter. As of the 15th century the family played an important role in the area and numerous traces of the family's trademark red color can still be seen in Cison today.